Ah, St. Patrick’s Day. It brings out a little Irish in all of us. And, for some reason…it makes me want to make green food. And not just green food…minty green food. I can’t explain it. It just happens. It’s one of those things. Well, originally, my plan for St. Patrick’s Day breakfast was going to be some elaborate Irish breakfast of sorts…done vegetarian and gluten-free, of course. But, then my roommate woke up much earlier than expected so I executed Plan B.
But…how to do Irish pancakes? I mean, aside from potato pancakes (or boxty…which I could have made…but didn’t…), how can you get your Irish flap-jack on? Below is my recipe for these exciting, duel colored pancakes. This is a super-easy recipe to make. And you can use any baking and pancake mix for the batter. As I am gluten-free…I do that. So, give this a go…and enjoy! Turn griddle to medium heat. Combine dry ingredients in a large bowl, excluding the cocoa powder and the dark chocolate and mint morsels. In a separate bowl, combine the wet, excluding the peppermint extract, and then add them to the dry. Stir until just combined and no large lumps remain. Split the batter into two bowls. Add another splash of milk and the cocoa powder to one. And add several drops of green food coloring and the peppermint extract to the other. Split the dark chocolate and mint morsels between the two bowls and gently fold them into the batter. Spoon about 1/4 cup of each batter onto the greased griddle. Carefully flip when bubbles appear on top or the edges look dry, then cook for 1-2 minutes more. Top with extra dark chocolate and mint morsels and maple syrup. I loved the play of colors in these pancakes. The only difference in my recipe is that in the chocolate pancake batter I folded in Guittard’s green mint chips and in the minty green batter I folded in Hershey’s Semi-Sweet Chocolate Chips. Only because I had them in my pantry. Otherwise, they would have gotten the Nestle’s Dark Chocolate & Mint Morsels in each batter. I did, however, use the dark chocolate and mint morsels to top off each serving of pancakes that morning. And these were a huge success. Minty, fresh, hot, and chocolatey all at once. It made for a great breakfast. And I was very happy with the way the pancakes fluffed up, even without eggs, and how light they were. The flavors were definitely spot-on for a fun St. Patrick’s Day breakfast. But, why just do this for St. Patrick’s Day? There is something so amazing and delicious about mint and chocolate…these are honestly good any time. Nothing could be easier…and oh…so delish. 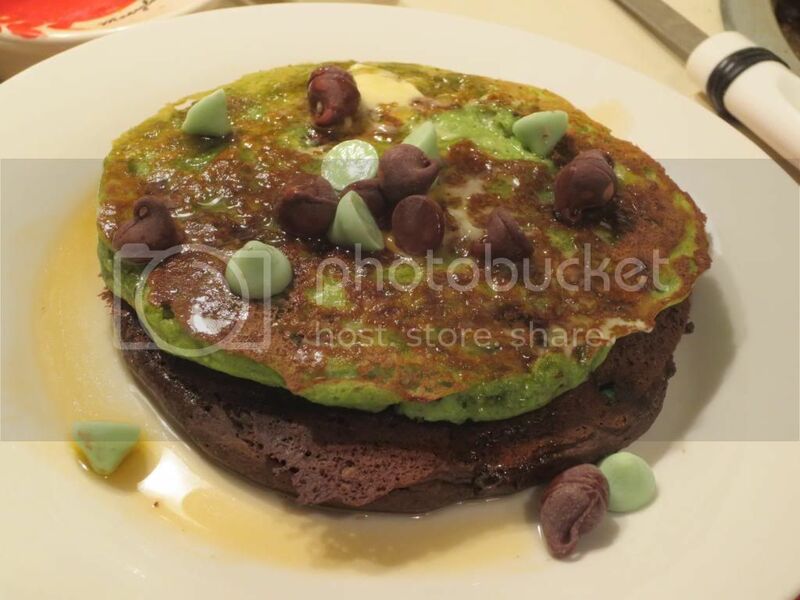 This entry was posted in Breakfast, Chocolate, Entree, Food, Gluten-Free, Mix, Pancakes, Recipe, Sweet Stuff, Vegetarian by The Celiathlete. Bookmark the permalink.